ACE Brand Sports Products has just released an exciting new mobile campaign, created with the FunMobility Mobile Advertising Platform. 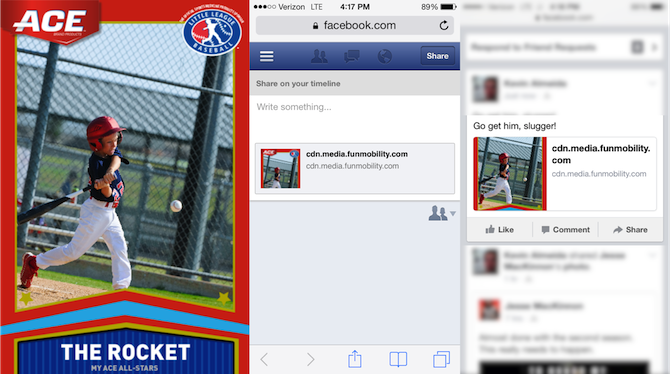 ACE is driving brand advocacy and social share by allowing users to create and customize Little League baseball cards featuring photos stored on their mobile devices. The campaign is designed to leverage ACE Brand’s official sponsorship of Little League, generating emotional engagement at a local level by making the brand an integral part of how families and communities share the memories of childhood experiences. Consumers can take a new photo from within the mobile promotion itself, or choose an existing image and insert in a number of different baseball card frames. Users can then share the card with friends and family on Facebook, Twitter and Pinterest. “The broader goal of the campaign is to engage consumers around ACE Brand’s Little League sponsorship anywhere, through a fun digital experience that will provide them a memento of their favorite little leaguer,” said Taylor Harper, brand manager at ACE Brand Sports Medicine Products. Freddie Freeman—all-star professional baseball player and former Little Leaguer—has partnered with ACE to endorse the campaign. Produce giant Chiquita, another official Little League sponsor, is also utilizing the FunMobility platform to create these branded baseball cards to drive social share and brand value. 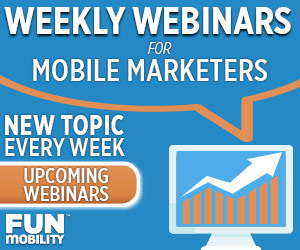 The ACE campaign demonstrates just one of a wide variety of mobile ad experiences available with FunMobility’s Rich Media Advertising Toolbox, which can be used to customize mobile ads to align with any marketing or advertising goal. To learn more, visit FunMobility.com.